A Chamberlain Avenue home that is set to be renovated by Tower Construction partly with a city home funding grant is seen on Aug. 9, 2017, in Chattanooga. The City of Chattanooga's Department of Economic & Community Development is working with various agencies to create more affordable housing. It might be a 600-square-foot studio or a 6,000-square-foot lakefront edifice. It might be a downtown apartment atop a retail building, a renovated warehouse condo, a close-in duplex or a suburban four-bedroom fronted by a green lawn, but it's home for somebody. Chattanoogans live in all kinds of places and all kinds of ways. And now the city is trying to get a sense of those places and ways, to figure out what's here, who's using it and how to look ahead to housing needs as the community grows and changes. On Saturday, Chattanooga's Department of Economic and Community Development and the Chattanooga-Hamilton County Regional Planning Agency will host a conference that looks at trends, challenges, and opportunities in housing. The Housing Connections Conference will bring together citizens, advocates, developers, policymakers, and other stakeholders to discuss the city's housing agenda. The half-day session at the Family Justice Center is the first of a two-part series that will include discussions of current housing programs in Chattanooga, details on the city's new Affordable Housing Fund, and potential legislative actions to expand affordable housing options, better serve our community's homeless population, and stabilize local neighborhoods. "We're talking about the entire 177,000 people who live in Chattanooga, not just one person, one block or one neighborhood," said Donna Williams, administrator of economic and community development for the city of Chattanooga. "We want to increase awareness and empathy for the many different types of individuals and families who are seeking housing and how their circumstances shape their housing needs," Williams said in a news release. "We want to be a city that emboldens Chattanoogans and help break down the barriers that are preventing them from living the lives they want, and we recognize how important secure, safe, affordable housing is to achieving that goal." Williams said the fact that all 120 tickets were snapped up within three days after the conference was announced shows "there's a lot of people who have an interest in this." A follow-up session to discuss solutions is set for Nov. 10. City residents face myriad issues. 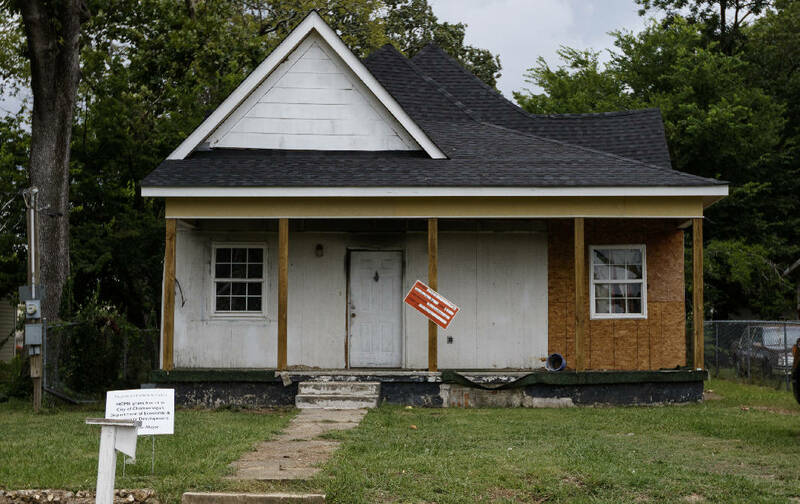 Some neighborhoods are languishing for lack of attention and investment, where others are in danger of losing their historic character because of rapid redevelopment. The boom in upscale housing and market-rate apartments is bringing high-income residents but cutting out people whose earnings have stagnated. Married couples may want things that don't appeal to singles, and different generations have differing housing needs and preferences. Mayor Andy Berke has put a focus on affordable housing and included $1 million in the current year's budget to work to expand housing options for moderate- to low-income people. Williams couldn't say how much affordable housing the city needs because, she said, it's a "moving target." "Estimates from various studies vary widely and the definition of 'affordable' varied in the,m as well," she said. "That, coupled with the rapidly rising cost of housing, means we're all working with a moving target as a family who didn't need affordable housing two years ago may find themselves in need today." She added that "the overall housing market is an inextricable factor when it comes to the production of housing available at prices that don't exceed 30 percent of our incomes. That's true of both rental product as well as for-sale product. "For example, if we were in a housing market similar to that of the Great Recession, the focus on affordable and income-restricted housing would be diminished because reasonably priced housing was plentiful, demand was much lower and the cost of housing was less expensive." Chattanooga participates in a variety of programs through the Tennessee Housing Development Agency and others, but Williams said many people don't understand that the federal dollars funneled through such agencies come with stringent rules on how they can be used. The city also has partnerships with nonprofits such as Chattanooga Neighborhood Enterprise and Habitat for Humanity, along with a toolkit of incentives in the form of tax breaks, that it can use for housing. The conference is aimed at bringing together housing and planning experts with neighborhood and community leaders to "open up the conversation and let people in on it," she said. Regional Planning Agency Executive Director John Bridger will kick things off with a discussion of housing types and trends, and a panel discussion will follow with Bridger, local developer Charles Adamson, city housing director Sandra Gober and Michael Gilliland, board chairman of Chattanooga Organized for Action. Gilliland said his group was involved throughout the planning of the conference and he's hopeful it will help "make sure the housing supply is actually meeting the needs of people in the community." "We do not have a long-range, broad plan to address the significant and increasing gap in housing," he said. "We're glad the city is recognizing [the value of] having an informed group of the public that is pushing for meaningful, affordable, safe housing for everyone in Chattanooga."